The main difference between SQL and TSQL is that SQL is a language that is used to store and manage data in an RDBMS while TSQL is an extended version of SQL designed to perform operations on MS SQL server. A database is a collection of related data. Database Management System (DBMS) is a software that helps to manage data in a database. 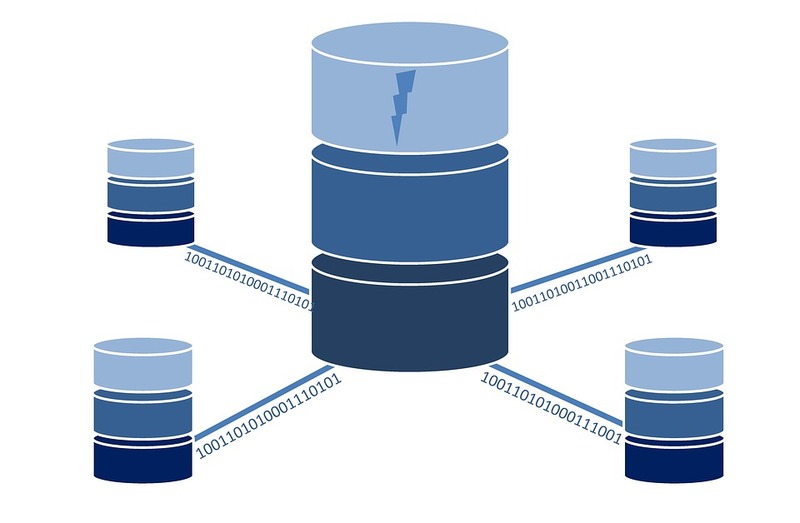 Moreover, Relational Database Management System (RDBMS) is an enhanced DBMS. It stores data in tables, and these tables are related to each other. The developer can use SQL language to perform operations on an RDBMS. Furthermore, TSQL is an extended version of SQL. SQL stands for Structured Query Language. It is an ANSI /ISO Standard database language that helps to store and manipulate data in an RDBMS. Most RDBMS such as MySQL and Oracle use SQL as the standard database query language. It is possible to perform various operations on the data stored in RDBMS using SQL. The developer can write queries to create tables, create databases, insert, update, delete data and many other operations. There are three types of SQL commands as follows. SQL is the query language for most RDBMS products. Various RDBMS product vendors developed their own database language by extending SQL according to their product. 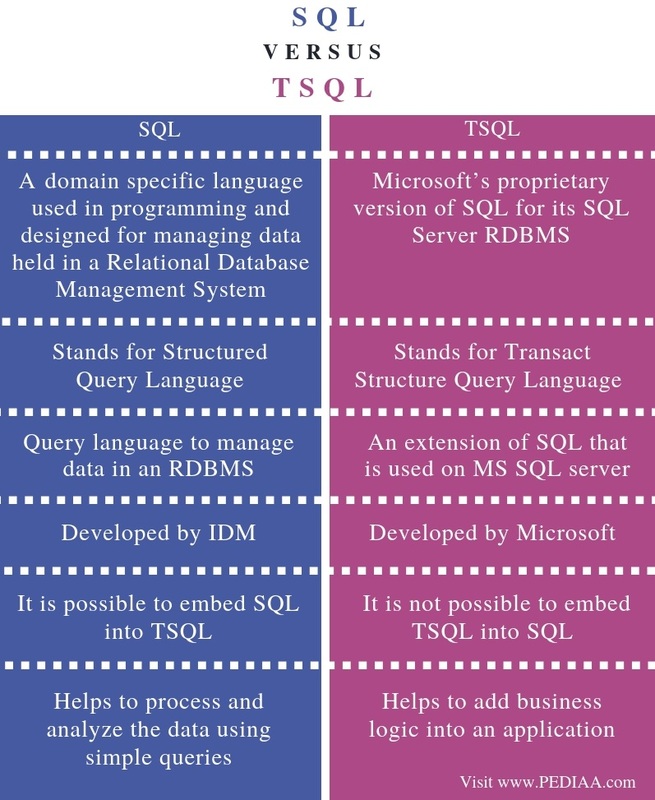 TSQL is an extension of SQL which was developed by Microsoft. TSQL stands for Transact Structure Query Language. It is the SQL version of Microsoft SQL Server. The applications can communicate with the SQL Server by issuing TSQL statements. The developer can write queries to perform operations on tables, join tables, and add constraints. He can also perform transactions, write stored procedures, views, indexes and many more. There are various numeric, string, date functions. Moreover, there are aggregation functions to perform an operation on a set of values. SQL is a domain specific language used in programming and designed for managing data held in a Relational Database Management System. In contrast, TCL is Microsoft’s proprietary version of SQL for its SQL Server RDBMS. Thus, this is the main difference between SQL and TSQL. Moreover, SQL stands for Structured Query Language while TSQL stands for Transact Structure Query Language. SQL is the query language to manage data in an RDBMS whereas TSQL is an extension of SQL that is used on MS SQL server. IBM developed SQL while Microsoft developed TSQL. This is another difference between SQL and TSQL. Also, one other difference between SQL and TSQL is that it is possible to embed SQL to TSQL, but it is not possible to embed TSQL into SQL. While SQL helps to process and analyze the data using simple queries, TSQL helps to add business logic into an application. Hence, this is another difference between SQL and TSQL. The main difference between SQL and TSQL is that SQL is a language that is used to store and manage data in an RDBMS while TSQL is an extended version of SQL designed to perform operations on MS SQL server. In brief, TSQL is a version of SQL which is the implementation for Microsoft SQL Server. 1. “Introduction to SQL.” Types of Network Topology in Computer Networks | Studytonight, Available here. 2. “What Is Transact-SQL? – Definition from Techopedia.” Techopedia.com, Available here. 3. “What Is T-SQL (Transact-SQL)? – Definition from WhatIs.com.” SearchSQLServer, Available here.